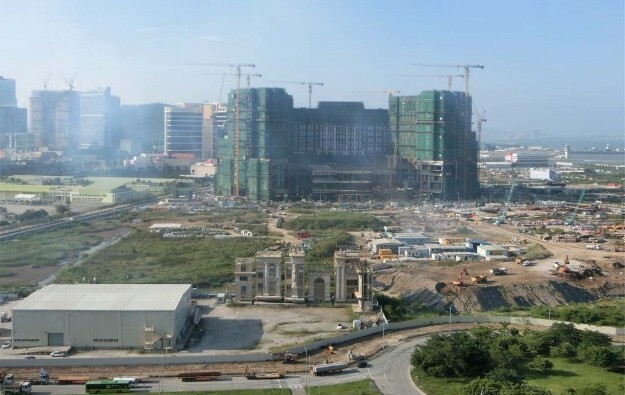 The management of Macau casino operator SJM Holdings Ltd said on a conference call with analysts on Thursday – following its first-quarter earnings results – that the opening of its under-construction new resort on Cotai (pictured in a file photo) would be moved to the second half of 2018. The company had previously said that it expected construction of the Grand Lisboa Palace to be completed by the end of 2017, with an opening in the first half of 2018. The cost of Grand Lisboa Palace could go higher than the currently-stated HKD36 billion (US$4.63 billion) if the project is delayed beyond its newly-declared deadline of the second half of 2018, said a Thursday note from brokerage Sanford C. Bernstein Ltd.
“Management highlighted that the opening will now be in the second half 2018 (prior [previously] first half and our estimate of summer 2018),” wrote Sanford Bernstein analysts Vitaly Umansky, Zhen Gong and Yang Xie. According to data from Macau’s Statistics and Census Service, in the first quarter, the wage index of construction workers increased by 3.6 percent quarter-on-quarter in real terms. The average price of concrete fell by 5.0 percent quarter-on-quarter, and that of spiral and round reinforcing steel bars rose by 1.9 percent, said the bureau. As recently as April 6, at the signing ceremony for a HKD25-billion package of syndicated loans for Grand Lisboa Palace, the firm’s chief executive Ambrose So Shu Fai had referred to a first-half 2018 opening for the property. On March 16, Mr So had denied in comments to local media any suggestion that the budget of HKD36 billion – as stated at that time – represented an increase from the HKD30 billion outlined in earlier company statements. He said some cost items had not previously been mentioned. Grand Lisboa Palace will have three hotel towers under the brandings “Grand Lisboa Palace”, “Palazzo Versace”, and “Karl Lagerfeld”, supplying an aggregate of approximately 2,000 rooms, SJM Holdings has noted in previous company filings. The latter hotel brands have links to major European fashion brands popular with mainland China consumers.